1 Frode receives an award on behalf of Savoy for "Best pop group" at the annual "Spellemannprisen 2001" (NRK1). 29 The Pakistani band "Junoon" release their album "Daur-e-Junoon", it features the track "Piya" sung by Morten Harket. 30 An long interview with Morten and Sondre Lerche is published in the Norwegian newspaper "VG". The video for "Forever Not Yours" is filmed in Havana, Cuba and directed by Harald Zwart. 2 On the Norwegian TV show "Absolutt Underholdning" (TV2), a-ha get a mention and some of the video for "Forever Not Yours" is shown. a-ha's first single "Forever Not Yours" from their forthcoming album "Lifelines" is released commercially in parts of Europe. 3 a-ha are guests on the German TV "Harald Scmidt talkshow" (SAT 1) and perform "Forever Not Yours" live. 4 A report on a-ha is broadcast on German TV "Planet VIVA" (VIVA) (repeated 07.04.2002). a-ha are at the "Top Of The Pops" studio to record three performances of "Forever Not Yours" (playback). 5 a-ha on Interaktiv (VIVA). 6 a-ha are on the German TV show "80er-Show" (RTL). 8 "Forever Not Yours" is released in Norway. 10-11 a-ha are in France for some radio and TV promotion including "FnacTV" and "TF1". 11 In the morning, there is an interview with Magne and Morten on French radio "Europe 2". 12 a-ha are in Copenhagen, Denmark and is interviewed by the media, including "Radio MEGA", "Radio The Voice", "P3" (National radio), "DR-TV" and "TV2". 13 An interview with Morten is published in the Norwegian "Dagbladet" magazine. 14? a-ha are interviewed on the Danish TV show "Boogie". 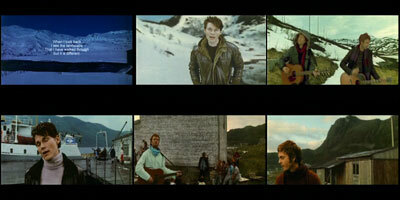 16 a-ha are in Switzerland and are guests on the show "4 You" (Viva Swiss). An interview with Morten is printed in the Norwegian newspaper "Dagbladet". 18 An article is printed in the Norwegian newspaper "VG". 19 Morten is interviewed on the Fredrik Skavlan show "Først og sist". 22 a-ha are in the studio for the TV show "Up North" (MTVE). 24 An interview with a-ha is broadcast on "SWR3", Germany. 26 a-ha are in Munich and appear on the German TV-show "Guinness - Die Show der Rekorde" (ARD) (broadcast 27.04.2002). 27 The album "Lifelines" is released in Norway. 29 An interview with a-ha is broadcast on Danish radio show "Radar" (P3). a-ha appear on National Danish TV. The album "Lifelines" is released in Germany and other parts of Europe. Magne will decorate a 3m tall ceramic jar for Vågsalmenningen square in Bergen, Norway. 2 Yamano Music Corporation, Japan hold the event Morten's talking show (TBC). 5 Spektrum, Oslo, Norway (invite only). 8 Ullevaal, Oslo, Norway. The video for the third single "Did Anyone Approach You?" was filmed before, during and after the concert. 10 The album "Lifelines" is released in the UK. 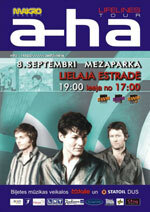 20 a-ha are on the UK TV show "Pepsi Chart Show" (Channel 5) which was recorded in Oslo on 8 June. 24 An interview with a-ha is broadcast on the UK TV show London Today (ITV). Morten appears on the UK TV show "Liquid News" (BBC1) (00:40). 26 An interview with Morten is broadcast on the UK TV show "Richard & Judy" (Channel 4). 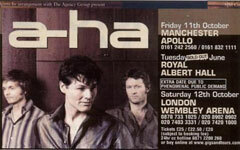 1 a-ha do some radio promotion in the UK and are interviewed by Simon Mayo and Richard Allison on BBC Radio 2. They are also interviewed on the breakfast show on Heart 106.2; interview ith Toby Anstis on Heart 106.2; interview with Mel and Sue on BBC London (1st or 2nd July). Morten is interviewed on the UK TV show "V Graham Norton" (Channel 4). 2 a-ha are interviewed by Nicky Campbell on Five Live and they are on VH-1 (TBC). 3 a-ha perform "Lifelines" in the studio on "Get Up And Give" on the UK TV show "GMTV". 8 The second single (first in the UK) from the album "Lifelines" is the title track and is released in the UK and Germany. 15 "Lifelines" is released in Norway. 23 a-ha perform a live version of "Lifelines" on the UK TV show "TOTP2" (BBC2). 14 Credicard Hall, São Paulo, Brazil. The set list includes: -Minor Earth Major Sky, You Wanted More, The Sun Never Shone That Day, Lifelines, Manhattan Skyline, IÕve Been Losing You / The Blood That Moves The Body, Time and Again, Did Anyone Approach You?, Turn The Lights Down, Stay On These Roads, Hunting High and Low, Locust, Take On Me, The Living Daylights, Forever Not Yours, Summer Moved On, The Sun Always Shines On T.V. 15 Credicard Hall, São Paulo, Brazil. The set list differs from the previous night with the songs played in a different order and "Manhattan Skyline" and "Turn The Lights Down" replaced with "Scoundrel Days" and "Dark Is The Night". 16 ATL Hall, Rio de Janero, Brazil. The set list is the same as the previous night except that "You Wanted More" is replaced by "Manhattan Skyline". 17 Rodeio de Barretos, Barretos, Brazil, approximately 40,000 people attend. 20 Ginásio de Esportes Gigantinho, Porto Alegre, Brazil, approximately 8,000 people attend. 30 The third single "Did Anyone Approach You?" from the album "Lifelines" is released in Germany and Norway.